Post July 20-21: Fulford, Keenan, Wilcock, the cabal, and aliens. Still waiting for your saviors and galactic friends? Still believe these guys? What does SOON mean? Walter Russell, the man who discovered Universal Law, this partial work below was first published in 1947. If you have not yet read his work, I suggest you do. I find it very easy to comprehend with simple language and I could feel his godliness and love in all that he wrote. He was guided by Creator to do this work. We cannot be unconscious. We have always been conscious without the slightest awareness of it. Our confusion in this respect lies in mistaking sensation and thinking for consciousness. When we stop thinking, whether asleep or awake, we do not stop KNOWING, nor do we cease being consciously aware of our Being. We but cease to set our knowledge in motion to express idea through the pulsations of thinking. All nature sleeps when the sunlight lessens the ability of all things to manifest life. Sleep is the death half of the life-death cycle. One may say, “I am unaware of this or that,” but one cannot say “I am unconscious” when one is always conscious. Conscious awareness is KNOWING. Unawareness means that one does not yet know. Knowledge is within him which he can know when he desires to know. Sleep and wakefulness are positive-negative wave parts of a wave cycle, just as birth and death are opposite ends of a life cycle. thus “put to sleep,” they have not been rendered “unconscious”; their voltage has merely been lowered. it never does. We assume that bodies cease to be conscious, but consciousness is never in bodies. A local anesthetic stops pain. Pain is a too intense electric current. The voltage is too great for the nerve wires to stand the strain. They bum out, and the overcharge of burning out causes the pain. is in balance, it has no sensation. When the body is unbalanced, sensation informs it when and where, otherwise it could not function. there would be no such alternating conditions as sleep and wakefulness. This planet is carrying us on our uphill journey to our pinnacle. The sun is the generator which charges its batteries. The sun is that generator, but the earth is turning toward and away from its generator continually. charged daily and discharged nightly. Aeon: (AY-on) (Greek, “god,” “divinity,” “process,” “emanation,” “time cycle”) Gnostic term for a cosmically pervasive process, aware, animated, and animating. Aeons manifest sensory worlds by dreaming, rather than by the artisanlike act of creation attributed to the biblical father god. Adj., Aeonic. 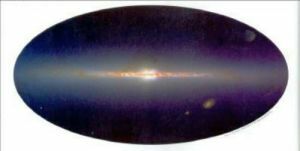 The “outpouring of energy” in the FGS describes the central event in Gnostic myth: how one of the massive luminous serpentine currents swirling the galactic core burst beyond the boundaries of the core. Science today recognizes that the galactic core has a boundary, but a soft, porous one, like the yellow of an egg. The structure of our galaxy conforms to a standard model, the regular lenticular spiral: a egg-shaped rotating core surrounded by limbs or spiral arms. The extent of the rotating arms is vast, but the arms themselves are thin, so the entire galaxy has the shape of a pancake with a central bulge. The dynamics of the core, the Pleroma, differ from the dynamics operating in the spiral arms, called the Kenoma, “deficiency, incompletion.” This is the difference between infinite and finite potential. The core is like a fountain head perpetually erupting with boundless, undefined potential. In the spiral arms, this cosmic potential scales down into the relatively limited, but still immense, potentiality of celestial events, including planetary systems where experiments in life can unfold. The galactic core or hub consists of a concentrated mass of high-energy currents, the cosmic gods. Its composite mass is pure stellar energy, the stuff that stars are made from, in a state of excitation that precedes and impedes the appearance of any particular form. Form arises in the Kenoma, the realm of finite potential. The composition of the outspreading galactic arms is not pure stellar luminosity but residue, the granular elements of past worlds. The entire galaxy is a vast glittering pinwheel that acts like a mill, grinding out future worlds from the residue of former ones. The dema, dense elementary matter arrays in the spiral arms, have some self-organizing properties but for the most part they are inert. The dema can produce suns, planetary systems, comets, nebular clouds, and so on, due to its own inherent dynamism, which is largely inorganic; but to produce living systems it requires activation from the galactic center. Hence, suns may be born and planetary systems formed in the dema, but for sentient life capable of self-awareness to appear in those worlds there must be a “input” from the galactic core. In the normal course of cosmic events, Aeonic currents remain dynamically within the boundaries of the galactic core. To produce experiments in worlds arising in the galactic limbs, Aeons project their power of intention (ennoia) outward while remaining where they are. Consider the analogy of massive kleig lights inside a white canvas tent. The power generators, bulbs, and mounting apparatus of these lights remain within the tent, but they can project beams through the canvas walls. So do the Aeons, the cosmic divinities, project their intentions and designs into the Kenoma without engaging dynamically in the dema, the dense elementary matter arrays. Then they observe what happens in the interaction between the inorganic field of the dema and the sentient-organic projections they have “seeded” into it. And so it goes in the usual course of cosmic events. The designing powers at the galactic center—Aeonic headquarters, if you will—allow for free play of boundless potential, trial and error, novelty and innovation, in the experiments they initiate. The divine powers do not interfere with an experiment in progress, otherwise they would not be able to see how it plays out on its own terms. But there can be exceptions in the cosmic order, and Sophia’s plunge is one of them. “The world as we know it came about due to a mistake,” (The Gospel of of Philip). The “mistake” is an anomaly rather than an out-and-out error. Sophia commits a misstep or overstepping of cosmic boundaries and a mistake arises as a consequence of her audacity. Sophias’s becomes enmeshed with the experiment she has projected, forced by her own compulsion, as it were, to go interactive with the subjects and conditions of the experiment. The dilemma faced by the goddess is the crucial plot factor of the fallen goddess scenario. Of course, there may also be other Kenomic experiments where something similar occurs. Gnostic cosmology is a multi-world perspective, even a multi-galaxy perspective. The texts assert that there are many Pleromas. It may be that we will get optimal insight and benefit from the fallen goddess scenario if we consider it to be unique to our world, describing conditions specific to the earth. If the myth of the Aeon Sophia specifically describes an event in this galaxy with particular consequences for the planet earth and humanity, as I am convinced is so, then we would do well to concentrate on our unique situation before speculating on what happens elsewhere or, ultimately, what happens in the scope of the Universe, the totality of all galaxies. The recognition that the fallen goddess scenario tells the story of OUR planet exclusively, and so engages humanity in an urgent and intimate way with the “earth goddess, ” presents a block for some people, I have noted. Interest in this particular galaxy, the planet earth, and the conditions of human existence in this unique habitat where we are, may act as a deterrent or self-selection factor. I have noted that some people don’t care for this limited scenario, preferring to go beyond it toward a larger picture. I would argue that the larger picture will come into view when our perspective here on earth is clear, including our view of the origin of the earth and the role of the human species in terrestrial design. But this earth-first view is not attractive to some people who (it seems to me) assume that some abstract vision of the larger picture will automatically make our situation on earth clear and comprehensible, if not purposeful. A Gnostic would advise cautious scrutiny of any cosmic perspective that overlooks the particular fate of the home planet, Gaia. The Sophia Mythos, as it may be called, is not, technically speaking, a creation myth like the Biblical account of creation in Genesis. Rather, it is an emanation myth consistent with the Aboriginal paradigm of the Dreamtime and the Hindu mytheme of “Vishnu dreaming,” i.e., the oneiric paradigm. From Greek oneiros, “dream.” Oneiric: of or relating to dreams or dreaming. The analogy to dreaming is a metaphor, if you will, but not just that. The oneiric paradigm describes a dynamic process in which life on earth is sustained in the way a dream is sustained by the dreamer. The characters in a dream exist and act as long as the dreaming continues. In the creationist paradigm, the creations persist after the initial fiat of the creator that brings them into existence. In Sophia’s dreaming, called apporia in the NHC, terrestrial life persists as the dream activity concurrentwith it unfolds. The creationist paradigm allows for humans to have a relationship to the off-planet deity, usually realized in an act of faith, but relating to Gaia-Sophia is interactive and experimental. 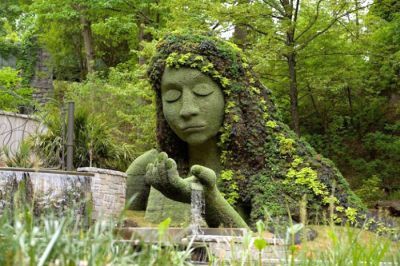 We know Gaia in the immediate sensuous presence called nature, but interacting with her dreaming requires a dialogue with the mind of nature, the indwelling intelligence or Anima Mundi (“soul of the world”). In short, this habitable world of ours has not been created as an artifact, like a pot made by a potter, but is continually being emanated by the Aeon who dreams it. The assertion that the world was not created once and for all but is continually emanated is a first-hand truth of experimental mysticism, attested by many mystics and psychonauts who have enjoyed this mysterious dynamic perception both with and without the use of psychoactive agents. 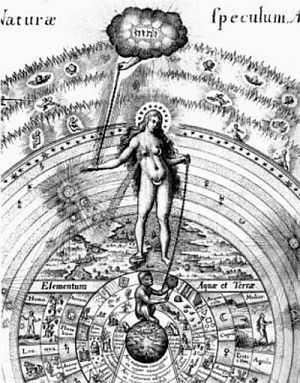 Well-known image of the Anima Mundi from an alchemical text. It shows the continuity from an extraterrestrial Pleromic realm (cloud with Hebrew lettering and extended hand) to the Divine Sophia to the rational mind of humanity (squatting monkey), with many divisions of the celestial and terrestrial elements. The entire ensemble might have been conceived with this line in mind: “All natures, starting from the revelation of chaos, are in the Light that shines without shadow, and indescribable joy, and unutterable jubilation” (The Sophia of Jesus Christ, NHC III, 4. 20). The Light that casts no shadow is the Organic Light, the primary substance body of Sophia and all the Aeons, contrasted to her planetary body, the earth. Consider again the “mistake” that produced this particular world of ours: the compulsion of an Aeon to be engaged in an experiment projected from the Pleroma, the galactic core. The FGS describes how Sophia actually morphed into the planet earth. Her mass of living luminosity of Organic Light turns into the planet we inhabit by a process of condensation and densification. Sophia does not create the earth at all: she becomes the earth. Nor does Sophia create humanity. 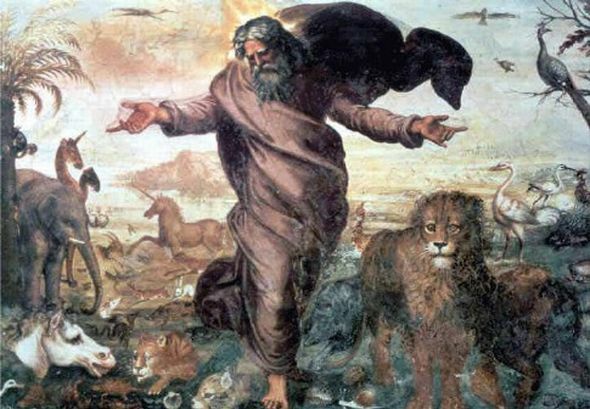 At least not in the way the paternal deity of the Bible creates Adam and Eve “in his image.” Gnostic writings explain that the Anthropos, the genomic template for humanity, is at first a featureless singularity produced from the Originator. called propater in the Greek loan-words in the Coptic books. The Originator is the monistic source of the multiple Aeons. Then the featureless singularity, an explosion of pure undefined possibility, comes to be configured by the Aeons of our galaxy into an experimental projection that will be implanted into the galactic arms. Variations of this event can be found in different texts. One version says that two Aeons, Sophia and Christos, undertook the encoding of the human genome (Anthropos). These two Aeons are as it were the “parents” of the human species, but not in a biological sense. Christ and Sophia make a syzygy, a dyad or cosmic coupling. Once they have configured the ground plan for the human genome, encoding it with countless capacities and talents, they join the entire Pleromic company to release it into the galactic limbs. The Anthropos then emerges from the cosmic center as a projection of the divine imagination of the gods, not a creaturemade in the image of any god. Such is the grand vision of the Mysteries on the origin of the human species. Gaia Mythos is a multi-world scenario, so the Anthropos template may be conceived as the matrix of many strains of the human species, able to emerge in many Kenomic experiments unfolding in the galactic limbs. But again, the Mythos is about one particular strain of humanity on that one particular planet subject to the anomalous plunge of the Aeon Sophia. The uniqueness of this story cannot be overemphasized. I like to think of John as my friend, although we have not been in touch much lately, his plate is full and with so many things happening around us, I don’t expect personal attention, I’m happy just knowing he is well. As for the following excerpt, which is an email I received yesterday, I am posting the last part of it only because it’s interesting to see how John views our current reality. I am sure that many of you do not know what GNE pertains to, or some other terms that John uses. Many of us partook in this experiment that lasted 3 years. It was mainly Gaia’s journey to the galactic core using John’s expert astronomy as a guiding map. You can get more information if you are interested on gaiaspora.org, in the meantime there may be some terminology you are not familiar with and that’s ok, it’s important that you get the gist of his thoughts and feelings. I value John’s thoughts and opinions very much and he’s one of the very few people that I trust 100%. But that’s just my opinion! I know you must be wondering at moments how the Nav views the world in Correction, and what insights, comments, or observations he might offer at the moment. Let me see what I can squeeze out of the ol’ navigator noggin… A little geopolitical commentary may be in order…. It took about two months before I began to get a sense of how Correction is working. Bear in mind that the GNE was a success: it produced a group of human witnesses to Correction. That was it’s stated purpose, in consideration of the view that the Wisdom Goddess needs “a measure of human participation” to succeed in Correction. The GNE and the emergent KWP assure that she has both witnessing (GNE) and participation (KWP, social activism). However, the success of the GNE does not guarantee the success of her Correction. These are two different matters, entirely. Now that Correction is underway all you can do is follow events and see if you detect how it is developing. One thing to recall, I never predicted or claimed that the entire world situation would change in a sudden spectacular way as soon as Correction began. Please be clear on that point. I can however assert that world events are coming rapidly to a gigantic climax and the shape of events, the direction of world drama, as awful as it looks, may indeed reflect how Correction is proceeding. I wonder if even the most horrific events might might be conditions that support her Correction. Meaning, of course, not that the Aeon requires or produces those conditions — they are the sum product of human behavior — but that she is ultimately able to turn them to her advantage. I mean in no way to imply that the horrors unfolding on the world stage are justified and required for a good outcome! That is the rationale of the righteous. And may the righteous be damned. Also, I never said that the Aeon would act supernaturally by striking at the high-end perpetrators and preventing them from completion of their evil plans. Of course, it was natural to wonder if such preventive action on her part might manifest. We all wondered about that possibility and how it might reveal itself. But specifically, exactly, I did not declare any assurance of such preventive action. For instance, I said that VV in her Tulpa (Rigden Labro) could be commanded to take out the Zads, the Talmudic perps at the executive level. Yes, but I did not say that doing so would insure the total defeat of their plans, did I? You must always remember that the action of the Tulpa, like the lethal strike of the KWP, is largely a rear-guard tactic. Of course, if any of you can command the Tulpa of VV to present WW3 I welcome you to do it. I would like to see the exact syntax of that command and know how you communicate it to her, how you get it into her syntax. But even if you were to succeed in commanding her to take out the PM of Israel, and she did it, would that stop what is happening now in Palestine? See what I mean? Exterminating the executives cannot stop the wave of violence they have set in motion. At least I doubt if it can. Extermination is a tactic to protect the course of society in Correction, once that hideous wave has crashed. Or perhaps just as it is crashing. It’s tactical aim is to prevent the monsters from rebooting their system in a world redirected on the course of healing itself. Can you get the nuances here… ? Bear in mind as well that human behavior over the long term historically (and “karmically” if you will) has its own perverse and irreducible momentum, which the Aeon is not going to change by intervention into historical events in some supernatural way — not as far as I can see. Her “intervention” is not guaranteed in Correction in that manner, so everything in human understanding of this moment depends on how you conceive “intervention.” I don’t rule out that it may occur in some manner that would be impossible to preconceive, as such an intervention from the mother power has never before occurred in human history. There is no precedent for it. No one can foresee the form it might take. And it might also happen in some way or ways that escape human attention. The important thing, the essential thing, is that you keep your attention on her, and focus on the consciousness and feeling of the earth as a planetary animal, even if you cannot detect exactly what she is doing and how she does it. Realistically speaking, I seriously doubt that WW 3 can be prevented at this point. As I write these words, the Zionists are working themselves into a fiendish frenzy of murder and destruction in Palestine. Such heights of evil are really inconceivable to ordinary folk like us. No ghoulish antics in a horror film come close to it. Even a snuff film is a pleasant diversion compared to that the Zionists are doing as I write these words. You can be sure those who are now undertaking a final solution in Gaza do so in throes of delight. They relish and revel in slaughtering children, burning and maiming defenseless people en masse. They really enjoy what they are doing. That is a fact which a sane human animal finds impossible to grasp. Additional to the wholesale and flagrant slaughter of the Palestinians, conducted in an attitude of drooling righteousness, events in the Ukraine have taken a sinister turn. Just today as I am writing this message a passenger jet of Malaysian airline was shot down over Ukraine. Someone did this act, but it will almost certainly be impossible to ever know who it was. But then it really does not matter who did it. The effect is to present the world with an event that can be spun in various ways by various parties in the drama unfolding. Clearly, it means nothing to someone to blow 300 people out of the sky simply for the purpose of creating a news event that can be spun to their advantage. Whoever they are. Everyone involved will use this event to suit their agenda, be sure of that. Thus the insanity feeds on itself and verifies itself. Realistically speaking, I don’t see anything that can stop WW 3 from happening in August 2014 except a stand down of the American military. But the good news is, if it does happen, it may be over by October. If WW3 is inevitable — it happens because those who can make it happen cannot be stopped. Simple enough? But if it does happen, it might viewed as a horror that can be “turned”, considered in tantric terms.… I would say, trying to be as careful as I can with the wording, that WW3 might not necessarily prove that Correction is failing… The big question for me is, If it does happen, how long will it last? And if it were to happen and then be stopped, arrested in mid-action (like the battle of Kurukshetra was stopped midway), then perhaps the social and global developments reflecting Correction would become more obvious and more vivid, shining with a particular luminosity in the smoky aftermath of the cremation ground. It’s gruesome to think of it that way, I know, but you might want to consider that possibility. Suppose for instance that WW3, additional to the horror and death it would certainly produce, would also have such a blowback on those who make it happen, that it finally destabilizes their mind control system to the breaking point. Their system of duplicity, division, and control is already at the breaking point, you say? Right, but not quite all the way. In their insanity they believe that a war will save them and they will come through with more power and control. But what if they get the war they want, and then when it is over — or interrupted, put on hold — they come out so weakened by the last great heave of their insanity, that they are THEN AND THERE taken down and defeated? In other words, what if that supremely evil event could be turned to the advantage of her Correction, but not avoided, not prevented? The worst would have to happen to be turned. This is a tantric principle. That is brutal consideration, I know, but honestly, I don’t see how WW3 can be stopped at this point, apart from a military stand down by the USA, and maybe not even then… It makes sense to me that Correction would become effective and obvious in the event of the war, within it and concurrent with it… so I am not assuming that Correction can ONLY proceed to success if WW3 does not occur. Brace for impact. I will write a little more about my current state of mind and health and concerns for my legacy in a follow up to this message. This series has VII parts to it. It is already in the Wingmakers Upper Menu if you wish to read the material. I have removed the questions and put it together as a document. Nothing has been changed or altered from the original material. Earth was and is a very unique planet. It was entirely of water originally. But what made it interesting to beings was the fact that its core enabled it to have a gravitational force that supported manifestation. This means that it began to traverse from an inter-dimensional planet of sound frequencies to a planet of matter—of physical matter. Its gravity producing core or nucleus was able to literally create the conditions that allowed it to materialize itself over eons of time. This is recorded on a disc from the twenty-third chamber at the Ancient Arrow site. This is also mentioned in Sumerian records that have not been widely distributed. So, earth started out as a water planet and it wasn’t physical. This was when the Atlanteans lived within the planet. They were a race of beings that inhabited earth at the time of its formation. The Anunnaki came to them and negotiated an agreement to allow the Anunnaki to mind a substance near the core of the planet that would be –in its essence—what we call gold today. These races of beings known as the Atlanteans and Anunnaki were not three-dimensional. They didn’t possess bodies as we think of them today. Their existence was contained in a different range of frequencies—what we would call higher-dimensional-frequencies. Although nobody really knows why the gold was needed, but it had something to do with the way gold modulated the frequency of their body. Gold held a property that was vital to their survival. The record is a little vague as to exactly what it was so important. But these records mention that their entire planet had twelve major cities and all of them were made of a semi-transparent gold. Even the book of revelations refers to this. The Anunnaki are a race of trans-dimensional beings. The Atlanteans were the only race of beings on earth at the time, and they-the Anunnaki-sought permission to set-up mining on earth, which the Atlanteans agreed to. They didn’t see any harm in helping the Anunnaki. They weren’t a competitor because the Atlanteans were more numerous. The Atlanteans wanted to have an agreement with the Anunnaki if only to befriend them for their technology. Also, the gold mining was in an area of earth that was of little consequenc to them. The earth began to materialize more and more. It began to harden in a sense and the gold with it. The earth, and everything on it, was solidifying. The mining of the gold would soon become impossible for the Anunnaki, because they’d be unable to mine the gold if it were in a dense, physical state. Their bodies were etheric. They could not mine the gold if it was physical. They needed bodies that would be able to operate on earth and mine the gold. This happened over a period of tens of thousands of years. So, the point is that they needed to create a physical vessel like an astronaut would require a spacesuit to inhabit space. They tried hundreds of experiments and had the help of both the Atlanteans and Sirians. So the Anunnaki created a physical body to mine gold. It’s a human body of sorts, but it was referred by the Wingmakers as human instruments. These were the equivalent of ape-men; they were pre-human by a long shot. But they were our predecessors. The Wing makers refer to them as Human 1.0. They were completely biological, but Human 1.0s were not fully physical. They were partly etheric. The Anunnaki and Sirians designed them to synchronize with the evolving densification of the Earth. So as the earth solidified, so did the human instruments. The Anunnaki and Sirians placed the Atlanteans inside these human uniforms. These were very advanced beings, but apparently naive. It was not in their interest at all, in fact they allowed the Anunnaki to mine their gold, but as the earth began to solidify, they told them that if they could engineer a vessel to enable them to continue to mine their gold, that would be acceptable, but on a small scale. The Anunnaki had some kind of a falling out with the Atlanteans and began to conspire with the Sirians and another race referred to as the Serpents. Each of these three races was interested in figuring out how to embody physical planets. They saw earth as a laboratory of sorts to figure it out. The Anunnaki already had a human uniform; they simply needed to power it with a life source or soul. The bigger issue was how to get the Atlanteans into these embodiments and keep them there. In effect, these three races conspired to enslave the Atlanteans within these pre-human vessels. The Atlanteans were the power generators that made these biological entities operate. It’s a very complicated subject. The Wingmakers wrote about the implantation of programs inside the human uniform—even version 1.0. The Sirians were mostly credited with this invention, but it was the offspring of Anu that really perfected these implants by programming them. The human uniform version 1.0 was designed by the Anunnaki, the implants were designed by the Sirians and the programming of the implants was designed and evolved by a being known as Marduk. It sounds strange as to how a powerful soul would suddenly be plugged into an ape-man vessel and behaves like a Neanderthal. These were actually much more primitive than Neanderthals. But the answer is the implants. You see, the biological entity or ape-man, as referred to it, was not able to operate in the physical world. They needed survival skills, how to eat, how to hunt, how to clean themselves, how to even move their bodies. All of these fundamental functions were necessary to actually include or program into the vessel which was the purpose of the functional implants. The implants were akin to the brain of the Human 1.0, but it wasn’t just in the brain. These implants were placed inside the body within various parts-like the chest area, middle back, wrists, ankles, etc. The primary ones were contained in the skull. But generally these implants were networked to operate from the head or brain area. I say head or brain area because the Human 1.0 was still part etheric and part physical. The implants also needed a similar consistency or sound vibration. They were placed into the bone or skeletal structure mostly, and some in the muscle tissue. These functional implants fused into the muscles and bone, including the DNA. The Wingmakers put it this way: the DNA integration was for the intelligence of the plan; the muscle tissue allowed the life essence to power the functional implant. There was a central coordination point and that was in the brain, but the implants were located throughout the body. This was an integrated system that was installed in the human uniform to allow it to be controlled, monitored, and programmed over time. It was the evolutionary stick and carrot. Doing it this way, allowed the early humans to dig out gold, which, was their primary purpose initially. So, one must ask: How does one get such an advanced race as the Atlanteans could power these ape-men and become slaves. The implanted functionality was partly to make the Human 1.0 and its power source—the life essence of an Atlantean—to function efficiently and effectively as miners. That was the prime goal. The second, however, was to suppress the power source, or in this case, the Atlantean beings inside the human vessels. They did this by making the power source ignorant of its origin and the reality of its true expression as an infinite being. When the Atlantean beings were placed inside the human uniform, they were essentially 100 percent focused on physical survival and functional performance. There were no relationships. No Marriage. No reproduction. These were essentially cloned beings. They were all the same in terms of their appearance and abilities. Human drones, piloted by implanted functionality that the Atlantean beings inside became associated with, as them. The infinite inside the body believed it was the body and the implanted functionality, and nothing more. Although the Atlanteans were infinite, meaning they did not have space-time regulation, they lived after the body died. However, the Anunnaki created a set of planes or dimensions of experience that was the equivalent of a Holding Plane, that’s what the Wingmakers called it, where they could be recycled; this later on became the basis of reincarnation. It allowed the Anunnaki to recycle the Atlanteans. Some aspects of the implanted functionality were interdimensional, which is to say, it could assist in the delivery of the beings to the proper location within the Holding Planes of consciousness, and assist in their reincarnation back into a new vessel. So, there was no reproduction in version 1.0. These were very basic. But the Anunnaki could create them in large scale, so when one human uniform expired—let’s say they had a mining accident—another would be made. These were clones. The ability to self-reproduce came in version 2.0. That was mostly because the amount of effort required to manage this process was enormous, on the part of the Anunnaki. They wanted to create an automated system, something that wouldn’t require them to orchestrate all of the variables. So the Sirians helped them to create the implants that could propagate through reproduction. This enabled automation of the recycling of the beings from the Holding Planes to be born into the physical dimension through a baby. The Universe is made up of dimensions that are a result of mathematical equations. It is constructed from mathematics. Some beings understand how to apply mathematical equations to organize and plan space-time. It’s all created. This world is created, it’s not real. It’s a programmed reality. When I say plan, it can also be construed as control of space-time. That is to say, this is a programmed space-time reality. Once you can program space-time reality within a species like humanity, you can program at the individual level of a person right down to when they itch their nose, if you want to. It’s all mathematical equations. Marduk was intimately involved in the evolution of the species. That was his role. Of all the Anunnaki, he was the closest to the Human 1.0s. He understood them and even admired certain aspects of them. Unconsciously, perhaps, he began to alter their programs so the Human 1.0s behaved more like the Anunnaki. As they began to take on the characteristics of the Anunnaki, Anu and his sons, Enki and Enlil, were concerned by this. Marduk was programming emotions and feelings. He was evolving humans too quickly, but remember, this was the evolution of the functional implants, the interface between the power source—Atlanteans—and the human physical body. So it was the interface that was being evolved, which enabled the human body to show emotion, to communicate, to sense more of the three-dimensional world called earth, etc. The other thing that was happening was that as the earth continued to become more of a three dimensional solid, so did the Human 1.0s and their functionality implants. This growing densification also made it easier to control and suppresses the Atlantean power source inside the human uniforms. It was like a compression was taking place in and on this earth plane and it was deepening the gravity of focus on earth plane survival. There was another race called Serpents. They were simply based on reptilian DNA, but distinct from the Anunnaki. You could say they were related. They were known as life carriers. They seeded planets. They built food chains. You could say they were grocers of the planet. They didn’t get directly involved in the creation of the Human 1.0. Not in the technical sense. Their job was more to provide food and sustenance for it. So, how did the Atlanteans get forced into slavery when they were previously these powerful, sovereign beings? It’s not known exactly how it happened. The record the Wingmakers read was not specific to this topic. But the tone, or word that was used, was that the Atlanteans were naive. They had no reason to think it would be possible to become enslaved. It would be like a concept that was never used in their culture. No one ever did that nor could they. You can’t enslave an infinite being, unless, of course, you lock them into a human uniform. And that was the cunning of the Anunnaki and their Sirian partners. They launched this attack from such a bizarre angle that the Atlanteans couldn’t see it coming. I think it was an ambush or surprise attack. The primary differences between the 1.0 and 2.0 were the ability to speak or communicate. That was the major add-on that Marduk brought to Human 1.0. However, the psychological state of being a clone was too hard for Human 1.0. They all looked alike and had the same thoughts, so communication was helpful to a point, for example, coordinating a task, but actually having individual ideas, no. And this led to depression and psychological states, where, according to the Wingmakers, they literally went mad. This flaw was a huge problem. Anu decided to wipe them out, and this is the story of the great flood. Marduk managed to save some of the Human 1.0s from the flood along with other flora and fauna, but it was the end of Human 1.0. Human 2.0 was created. This was the stage where the humans could self-reproduce. And when this happened, some of the Anunnaki impregnated female humans and brought in their bloodlines to the human species. This began the variations. This began the idea that humans were no longer clones. The concern, however, was that Human 2.0s might become too powerful and self-aware. What if the Atlantean power source became aware that it was an infinite being? This was when Anu decided that he should be God. Humans needed to have a lord or ruler over them so it was clear that they were inferior to an external ruler. This was a key part of their program of indoctrination. Working with Marduk and the Sirians, they created the environment of Eden and created the Paradigm of Eve as the instigator of the fall of humanity. This was, you might say, Act 1 of Anu as God. It was staged to provide the Human 2.0s with a clear sense of an external authority, and that they were expelled from Paradise because they tried to be self-realized. It was like rebuking humanity with the fist of an angry creator who wanted his creation to remain identified with their human uniform. Kind of like saying:”Do not think for a moment that you can be like me”. So, the God of the bible is the Anunnaki Lord called Anu. Why did Anu want to be God? The original goal was the acquisition of gold. But when the Atlanteans rejected Anu, he began to conspire with the Sirians. It was just before the flood that Anu discovered that the gold he’d mined was sufficient. The Sirians and Serpents felt that the idea of enslaving infinite beings in planet ecosystems was their invention. They had something that was totally unique. They were creator-God and every other race could be ensnared in a similar type of vessel. And that is what they began to do; they began to enslave other races. The Earth had a unique quality to its core. This core was of extreme interest to the Anunnaki when they first visited earth. It was this core that created the gravitational field that enabled the planet to become fully physical in such a way that it could support physical life. Of course other conditions needed to be present, too, but it was this core that was the real key. Working with the Sirians and Serpents, they began to do this same enslavement on other planets. They replicated the core of earth and engineered a method for implanting this core on other planets. They were essentially terraforming a planet by cloning and installing earths’ core. I have read the five interviews with Dr. Neruda and I am still not back to reality. Once I started reading the material, I could not leave it alone. In fact, I came across interview #5 first and read it, then looked for the rest of them, but I must tell you, it’s well worth reading #5 first because this is where ALL the good stuff is. All I can say is this: If this information is real, if this information is what our reality is about right now, then everything I thought was real exists no more. This can profoundly change every single thought we create, every single channel we hear, every single prediction we want to believe in. It is that profound and I have not even started to put it all together, but I wanted my readers to have opportunity/choice to read it if they have not already. Any comments/thoughts would be welcome as I am not yet ready to comment on this. In the summer of 1996 two college students innocently stumble upon an otherworldly artifact while hiking in northern New Mexico near an ancient archeological site called Chaco Canyon. Through a chain of mysterious events, this artifact ends up in the hands of the ACIO, an ultra-secret, unacknowledged department of the National Security Agency responsible for reverse-engineering recovered extraterrestrial technologies. An exploratory team from the ACIO is dispatched to the discovery site of the Compass artifact where it is confirmed that the Compass is a homing device, leading the team to an intricately designed structure carved deep inside a canyon wall. A helix-shaped corridor spirals up through the rock with 23 chambers jutting out at ten-meter intervals. This amazing discovery is initially thought to be an extraterrestrial time capsule left behind by an alien race. Each chamber contains an enigmatic wall painting [pictured above] and an impenetrable technology artifact. In the uppermost chamber, the scientists uncover an optical disc presumably holding the information about the site’s creators and their purpose. Thousands of years earlier, aware of the earth’s distant future, the WingMakers constructed and left behind knowledge repositories upon earth, on each of the seven continents. [click the link to see where these repositories lie. It looks like one may be at Machu Picchu in Peru] The New Mexico site was the first of the seven to be discovered. These seven sites are linked together through some mysterious means, and the information contained within the sites is for an uncertain purpose. Alan Watts on the Meaning of Life. “As it is, we are merely bolting our lives — gulping down undigested experiences as fast as we can stuff them in —because awareness of our own existence is so superficial and so narrow that nothing seems to us more boring than simple being. Is it surprising that an existence so experienced seems so empty and bare that its hunger for an infinite future is insatiable? But suppose you could answer, “It would take me forever to tell you, and I am much too interested in what’s happening now.” How is it possible that a being with such sensitive jewels as the eyes, such enchanted musical instruments as the ears, and such a fabulous arabesque of nerves as the brain can experience itself as anything less than a god?